The redesigned Cayenne went on sale this year. A hybrid comes in 2011. Now that it's controlled by Volkswagen AG, Porsche AG reportedly is planning two small vehicles that the German sports car maker's previous management had nixed. Porsche is expected to increase the size of its Boxster roadster, leaving room at the bottom of the range for a smaller mid-engine car engineered jointly with VW. A small SUV also is likely to be added. Plug-in hybrid versions of the Panamera four-door sedan and Cayenne SUV also are part of a plan to increase Porsche's worldwide sales to 150,000 vehicles in the new few years. Entry-level roadster: A mid-engine car meant to attract younger buyers is expected to debut as early as 2013. It will be developed jointly with VW and will be based on the Volkswagen BlueSport concept shown at the 2009 Detroit auto show. Volkswagen will have a version, and Audi might, too. Porsche's previous management did not want the smaller car, saying it did not fit the brand's image as the maker of premium sports cars. Boxster: An electric version of the two-door roadster will be tested next year. Porsche has not approved the project, but if an electric Boxster gets the green light, it could be in production within three years. The Boxster will be redesigned in late 2011 or early 2012. The car also may get a four-cylinder engine in addition to its eight cylinders to cut fuel consumption and emissions. Cayman: A less-expensive version called the Clubsport is expected to go on sale in 2011. The coupe derivative of the Boxster will be redesigned in 2012 or 2013. 911: A new GT2 RS model will be added to the lineup in January. It will be the fastest car the company has ever built, says Porsche. Stripped of many luxury features, the GT2 RS has a twin-turbo, 3.6-liter six-cylinder engine with output boosted to 620 hp. The 911 Carrera GTS coupe and cabriolet will be debut at the Paris show this month and go on sale in the United States in January. The GTS models get additional standard equipment and a 23-hp boost over the 911 Carrera S to 408 hp. A re-engineered 911 is expected to debut at the Frankfurt show in autumn 2011 and go on sale in 2012. The exterior will change but not radically. The current engines will be upgraded. Panamera: A V-6 version of Porsche's first four-door car went on sale this year. A hybrid debuts in 2011; a convertible version is possible in 2012. 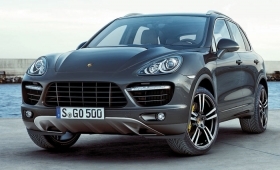 Small SUV: VW Group management has said it wants an SUV smaller than the Cayenne for Porsche. It probably would share the underpinnings of the Audi Q5. It could go on sale in 2013. 918 Spyder: The plug-in hybrid convertible concept, which debuted at the Geneva auto show in March, has been approved. The vehicle is expected to be priced at more than $600,000. Porsche says it has more than 2,000 serious buyers, 1,000 of them in the United States. The on-sale date has not been determined. The 918 Spyder is powered by the 3.4-liter V-8 that Porsche uses in race cars. Electric motors are mounted in the front and rear. Porsche hasn't disclosed many details but says the car develops more than 500 hp. The concept had a seven-speed dual-clutch transmission. Porsche brought 400 prospective U.S. buyers -- those owning multiple Porsches or the out-of-production, $575,000 Carrera GT supercar -- to an airport hangar last month at the Pebble Beach Concours d'Elegance to drive the car.